Most people get no further than the headline. What does it tell you? It is a British newspaper so presumably it is talking about the NHS. “Putting” is an active verb in the present tense so something different is happening right now which is leading to the effect. “Putting patients’ lives at risk” sounds pretty serious so people must be coming to real harm and it is a “study” so it must be true. Most normal people reading just the headline would take home the message that our struggling NHS is once again failing, probably due to bad management and budget cuts, and – no surprise here – people are getting hurt. It is a multinational study but it is not made clear how much if anything was conducted in the UK. It seems to be a very large study published in the Lancet, a top notch journal. It found that “every extra patient added to a nurse’s workload increases a patient’s chance of dying within 30 days of being admitted for surgery by seven per cent.” A really scary finding you will agree. Just a few extra patients will lead to loads of unnecessary deaths. Furthermore “patients are more likely to die after routine surgical procedures at hospitals with fewer nurses educated to degree level”. And guess what – the UK has amongst the highest patient/nurse ratios and lowest level proportion of degree level trained nurses in Europe. 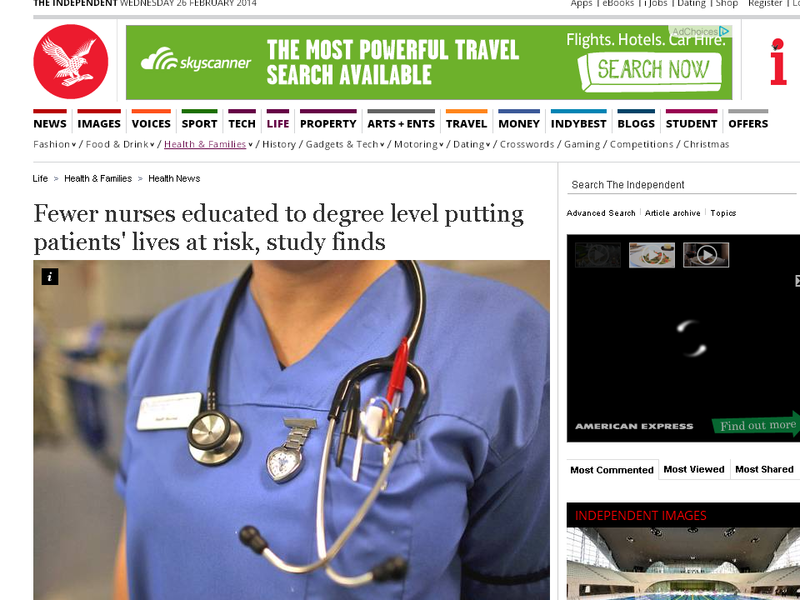 Not quite the message that nursing cuts are killing patient as implied by the headline but still pretty grim reading. Apologies that I cannot link to the full text which requires a subscription. It turns out that this is an observational uncontrolled study so it cannot tell us anything about cause and effect. Only 10% of the hospitals included were British. The death rates in British hospitals were no different from the other European countries. The authors concede that “(their) measure of education relied on each country’s definition of bachelor’s education for nurses, which differs by country” which makes it impossible to draw definite comparisons. They also concede a range of other methodological issues and conclude that “further research is required”. This study is valuable as it points to an association of higher level training and high nurse numbers with better patient outcomes – hardly a surprise – but it does not tell us why. Hospitals with more highly trained nurses may be more likely to be found in affluent neighbourhoods with a cooperative, healthier local population for instance. It is hard to believe that any intelligent person who has read the paper could believe that this conveys the essence of the story. It sensationalises a pretty ordinary finding. It misleads and misinforms. Worse it undermines confidence in our health services, demoralises staff and frightens patients. This must be DELIBERATE SENSATIONALISM and it is SHAMEFUL. We must not let it go unchallenged. It is not the first time we have seen this sort of shoddy journalism form the Independent. I have referred this article to the press complaints commission and will share my concerns on Twitter. I would encourage others to do the same.